Mycetoma is a chronic infection of skin and subcutaneous tissue. The condition was first described in the mid-1800s and was initially named Madura foot, after the region of Madura in India where the disease was first identified. Mycetoma infection can be caused by fungi or bacteria. When caused by fungi, it is referred to as mycotic mycetoma or eumycetoma. When it is caused by bacteria, it usually involves infection by the actinomycetes group; such cases are called actinomycotic mycetoma or actinomycetoma. Involvement of the lower extremities is common, and the disease presentation, whether caused by fungi or bacteria, is quite similar. Mycetoma infection typically results in a granulomatous inflammatory response in the deep dermis and subcutaneous tissue, which can extend to the underlying bone. Mycetoma is characterized by the formation of grains, which contain aggregates of the causative organisms that may be discharged onto the skin surface through multiple sinuses. The characteristic color of the grains can assist in the identification of the specific etiologic agent. Mycetoma due to actinomycetes should be differentiated from actinomycosis, which is an endogenous suppurative infection caused by Actinomyces israelii, other species of Actinomyces, or related bacteria, typically affecting the cervical-facial, thoracic, and pelvic sites (the latter is usually associated with the use of intrauterine devices). The branching bacteria that cause actinomycosis are non–acid-fast anaerobic or microaerophilic bacteria. These bacteria are smaller than 1 µm in diameter, smaller than eumycotic agents. Alternatively, the agents that cause actinomycetoma are always aerobic and are sometimes weakly acid-fast. The body parts affected most commonly in persons with mycetoma include the foot or lower leg, with infection of the dorsal aspect of the forefoot being typical. The hand is the next most common location; however, mycetoma lesions can occur anywhere on the body. Lesions on the chest and back are frequently caused by Nocardia species, whereas lesions on the head and neck are usually caused by Streptomyces somaliensis. The causative organism enters through sites of local trauma (eg, cut on the hand, thorn or foot splinter). Contaminated soil seems to be the real culprit, even when a splinter or thorn is implicated. A neutrophilic response initially occurs, which may be followed by a granulomatous reaction. Spread occurs through skin facial planes and can involve the bone. Hematogenous or lymphatic spread is uncommon. In Sudanese hospitals, at least 300-400 patients are diagnosed with mycetoma every year. In general, traumatic inoculation of fungal elements into the skin or subcutaneous tissue by a thorn or splinter typically occur in those who walk bare-footed (eg, farmers, field workers), especially in developing countries. Among the fungal pathogens responsible for mycetoma, Madurella mycetomatis is the most common pathogen described in Africa. Madurella grisea is the most common etiologic pathogen in South America. Pseudallescheria boydii (Scedosporium apiospermum) is the most common etiologic agent in the United States. 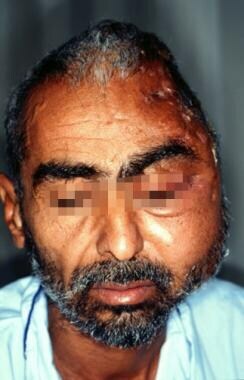 Mycetoma causes disfigurement but is rarely fatal in the absence of skull involvement. The lesions are painless and slowly progressive; however, secondary bacterial infection or bone expansion may cause pain. When secondary bacterial infection occurs, Staphylococcus aureus is the most common etiologic agent. In advanced cases, deformities or ankylosis and their corresponding disabilities can appear. Patients who are immunocompromised or who have undergone transplantation can develop invasive infection. Mycetoma in a 47-year-old shepherd from Mauritania who had a painless progressive swelling of the face for more than 20 years. Frontal view of mycetoma in a 47-year-old shepherd from Mauritania who had a painless progressive swelling of the face for more than 20 years. Mycetoma has no apparent racial predilection. Mycetoma is most common in persons aged 20-50 years, with a mean of 34 years. van Belkum A, Fahal A, van de Sande WW. Mycetoma caused by Madurella mycetomatis: a completely neglected medico-social dilemma. Adv Exp Med Biol. 2013. 764:179-89. [Medline]. Venkatswami S, Sankarasubramanian A, Subramanyam S. The madura foot: looking deep. Int J Low Extrem Wounds. 2012 Mar. 11(1):31-42. [Medline]. McNeil MM, Brown JM. The medically important aerobic actinomycetes: epidemiology and microbiology. Clin Microbiol Rev. 1994 Jul. 7 (3):357-417. [Medline]. Bonifaz A, Tirado-Sánchez A, Calderón L, Saúl A, Araiza J, Hernández M, et al. Mycetoma: experience of 482 cases in a single center in Mexico. PLoS Negl Trop Dis. 2014 Aug. 8(8):e3102. [Medline]. [Full Text]. Wenger PN, Brown JM, McNeil MM, Jarvis WR. Nocardia farcinica sternotomy site infections in patients following open heart surgery. J Infect Dis. 1998 Nov. 178 (5):1539-43. [Medline]. van de Sande WW. Global burden of human mycetoma: a systematic review and meta-analysis. PLoS Negl Trop Dis. 2013 Nov. 7(11):e2550. [Medline]. [Full Text]. Bakshi R, Mathur DR. Incidence and changing pattern of mycetoma in western Rajasthan. Indian J Pathol Microbiol. 2008 Jan-Mar. 51(1):154-5. [Medline]. Rattanavong S, Vongthongchit S, Bounphamala K, Vongphakdy P, Gubler J, Mayxay M, et al. Actinomycetoma in SE Asia: the first case from Laos and a review of the literature. BMC Infect Dis. 2012 Dec 12. 12:349. [Medline]. [Full Text]. Rouphael NG, Talati NJ, Franco-Paredes C. A painful thorn in the foot: a case of eumycetoma. Am J Med Sci. 2007 Aug. 334(2):142-4. [Medline]. Ahmed AO, Abugroun ES. Unexpected high prevalence of secondary bacterial infection in patients with mycetoma. J Clin Microbiol. 1998 Mar. 36 (3):850-1. [Medline]. Ahmed AO, van Leeuwen W, Fahal A, et al. Mycetoma caused by Madurella mycetomatis: a neglected infectious burden. Lancet Infect Dis. 2004 Sep. 4(9):566-74. [Medline]. de Hoog GS, Ahmed SA, Najafzadeh MJ, Sutton DA, Keisari MS, Fahal AH, et al. Phylogenetic findings suggest possible new habitat and routes of infection of human eumyctoma. PLoS Negl Trop Dis. 2013 May. 7(5):e2229. [Medline]. [Full Text]. van de Sande WW, Fahal AH, Goodfellow M, Mahgoub el S, Welsh O, Zijlstra EE. Merits and pitfalls of currently used diagnostic tools in mycetoma. PLoS Negl Trop Dis. 2014 Jul. 8(7):e2918. [Medline]. [Full Text]. Abd El-Bagi ME, Fahal AH. Mycetoma revisited. Incidence of various radiographic signs. Saudi Med J. 2009 Apr. 30(4):529-33. [Medline]. El Shamy ME, Fahal AH, Shakir MY, Homeida MM. New MRI grading system for the diagnosis and management of mycetoma. Trans R Soc Trop Med Hyg. 2012 Dec. 106(12):738-42. [Medline]. Kumar J, Kumar A, Sethy P, et al. The dot-in-circle sign of mycetoma on MRI. Diagn Interv Radiol. 2007 Dec. 13(4):193-5. [Medline]. [Full Text]. Jain V, Makwana GE, Bahri N, Mathur MK. The "dot in circle" sign on MRI in maduramycosis: a characteristic finding. J Clin Imaging Sci. 2012. 2:66. [Medline]. [Full Text]. Yousif BM, Fahal AH, Shakir MY. A new technique for the diagnosis of mycetoma using fixed blocks of aspirated material. Trans R Soc Trop Med Hyg. 2010 Jan. 104(1):6-9. [Medline]. Hemalata M, Prasad S, Venkatesh K, Niveditha SR, Kumar SA. Cytological diagnosis of actinomycosis and eumycetoma: a report of two cases. Diagn Cytopathol. 2010 Dec. 38(12):918-20. [Medline]. Chufal SS, Thapliyal NC, Gupta MK. An approach to histology-based diagnosis and treatment of Madura foot. J Infect Dev Ctries. 2012 Sep 17. 6(9):684-8. [Medline]. Ahmed AA, van de Sande WW, Fahal A, et al. Management of mycetoma: major challenge in tropical mycoses with limited international recognition. Curr Opin Infect Dis. 2007 Apr. 20(2):146-51. [Medline]. Falkson C, Sur R, Pacella J. External beam radiotherapy: a treatment option for massive haemoptysis caused by mycetoma. Clin Oncol (R Coll Radiol). 2002 Jun. 14(3):233-5. [Medline]. Maina AM, Macharia JT. Alleviating a Nomad's Anguish: Successful Treatment of a Case of Leg Mycetoma-A Case Report. Case Rep Orthop. 2012. 2012:753174. [Medline]. [Full Text]. Welsh O, Vera-Cabrera L, Welsh E, Salinas MC. Actinomycetoma and advances in its treatment. Clin Dermatol. 2012 Jul. 30(4):372-81. [Medline]. Agarwal US, Besarwal RK, Gupta R, Agarwal P. Treatment of actinomycetoma foot - our experience with ten patients. J Eur Acad Dermatol Venereol. 2012 Nov 26. [Medline]. Damle DK, Mahajan PM, Pradhan SN, Belgaumkar VA, Gosavi AP, Tolat SN, et al. Modified Welsh regimen: a promising therapy for actinomycetoma. J Drugs Dermatol. 2008 Sep. 7(9):853-6. [Medline]. Viguier M, Lafaurie M. Images in clinical medicine. Actinomycetoma. N Engl J Med. 2015 Jan 15. 372(3):264. [Medline]. Baril L, Boiron P, Manceron V, et al. Refractory craniofacial actinomycetoma due to Streptomyces somaliensis that required salvage therapy with amikacin and imipenem. Clin Infect Dis. 1999 Aug. 29(2):460-1. [Medline]. Ramam M, Bhat R, Garg T, et al. A modified two-step treatment for actinomycetoma. Indian J Dermatol Venereol Leprol. 2007 Jul-Aug. 73(4):235-9. [Medline]. Palit A, Ragunatha S, Inamadar AC. Actinomycetoma: dramatic response to modified two-step regimen. Int J Dermatol. 2011 Apr. 50(4):446-9. [Medline]. Estrada R, Chávez-López G, Estrada-Chávez G, López-Martínez R, Welsh O. Eumycetoma. Clin Dermatol. 2012 Jul. 30(4):389-96. [Medline]. Nenoff P, van de Sande WW, Fahal AH, Reinel D, Schöfer H. Eumycetoma and actinomycetoma - an update on causative agents, epidemiology, pathogenesis, diagnostics and therapy. J Eur Acad Dermatol Venereol. 2015 Feb 27. [Medline]. Salkin IF, McGinnis MR, Dykstra MJ, Rinaldi MG. Scedosporium inflatum, an emerging pathogen. J Clin Microbiol. 1988 Mar. 26 (3):498-503. [Medline]. van Belkum A, Fahal AH, van de Sande WW. In vitro susceptibility of Madurella mycetomatis to posaconazole and terbinafine. Antimicrob Agents Chemother. 2011 Apr. 55(4):1771-3. [Medline]. [Full Text]. van de Sande WW, Fahal AH, Bakker-Woudenberg IA, van Belkum A. Madurella mycetomatis is not susceptible to the echinocandin class of antifungal agents. Antimicrob Agents Chemother. 2010 Jun. 54(6):2738-40. [Medline]. [Full Text]. de Klerk N, de Vogel C, Fahal A, van Belkum A, van de Sande WW. Fructose-bisphosphate aldolase and pyruvate kinase, two novel immunogens in Madurella mycetomatis. Med Mycol. 2011 Jul 5. [Medline]. Zein HA, Fahal AH, Mahgoub el S, El Hassan TA, Abdel-Rahman ME. Predictors of cure, amputation and follow-up dropout among patients with mycetoma seen at the Mycetoma Research Centre, University of Khartoum, Sudan. Trans R Soc Trop Med Hyg. 2012 Nov. 106(11):639-44. [Medline]. Abd El Bagi ME. New radiographic classification of bone involvement in pedal mycetoma. AJR Am J Roentgenol. 2003 Mar. 180(3):665-8. [Medline]. Akhtar MA, Latief PA. Actinomycetoma pedis. Postgrad Med J. 1999 Nov. 75(889):671. [Medline]. Bapat KC, Pandit AA. Actinomycotic mycetoma. Report of a case with diagnosis by fine needle aspiration. Acta Cytol. 1991 Nov-Dec. 35(6):770-2. [Medline]. Bouza E, Munoz P. Invasive infections caused by Blastoschizomyces capitatus and Scedosporium spp. Clin Microbiol Infect. 2004 Mar. 10 Suppl 1:76-85. [Medline]. Campagnaro EL, Woodside KJ, Early MG, et al. Disseminated Pseudallescheria boydii (Scedosporium apiospermum) infection in a renal transplant patient. Transpl Infect Dis. 2002 Dec. 4(4):207-11. [Medline]. Chaveiro MA, Vieira R, Cardoso J, et al. 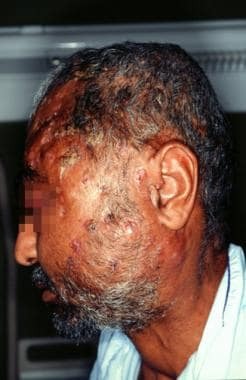 Cutaneous infection due to Scedosporium apiospermum in an immunosuppressed patient. J Eur Acad Dermatol Venereol. 2003 Jan. 17(1):47-9. [Medline]. Chávez G, Estrada R, Bonifaz A. Perianal actinomycetoma experience of 20 cases. Int J Dermatol. 2002 Aug. 41(8):491-3. [Medline]. Coukell AJ, Brogden RN. Liposomal amphotericin B. Therapeutic use in the management of fungal infections and visceral leishmaniasis. Drugs. 1998 Apr. 55(4):585-612. [Medline]. Develoux M, Dieng MT, Kane A, et al. [Management of mycetoma in West-Africa]. Bull Soc Pathol Exot. 2003 Jan. 96(5):376-82. [Medline]. Dieng MT, Sy MH, Diop BM, et al. [Mycetoma: 130 cases]. Ann Dermatol Venereol. 2003 Jan. 130(1 Pt 1):16-9. [Medline]. EL Hag IA, Fahal AH, Gasim ET. Fine needle aspiration cytology of mycetoma. Acta Cytol. 1996 May-Jun. 40(3):461-4. [Medline]. Fahal AH. Mycetoma: a thorn in the flesh. Trans R Soc Trop Med Hyg. 2004 Jan. 98(1):3-11. [Medline]. Fahal AH, Hassan MA. Mycetoma. Br J Surg. 1992 Nov. 79(11):1138-41. [Medline]. Fahal AH, Rahman IA, El-Hassan AM, Rahman ME, Zijlstra EE. The safety and efficacy of itraconazole for the treatment of patients with eumycetoma due to Madurella mycetomatis. Trans R Soc Trop Med Hyg. 2011 Mar. 105(3):127-32. [Medline]. Fahal AH, Sheik HE, Homeida MM, et al. Ultrasonographic imaging of mycetoma. Br J Surg. 1997 Aug. 84(8):1120-2. [Medline]. Fletcher CL, Moore MK, Hay RJ. Eumycetoma due to Madurella mycetomatis acquired in Jamaica. Br J Dermatol. 2001 Dec. 145(6):1018-21. [Medline]. Greenberg AK, Knapp J, Rom WN, et al. Clinical presentation of pulmonary mycetoma in HIV-infected patients. Chest. 2002 Sep. 122(3):886-92. [Medline]. Hay RJ. Fungal infections. Cook GC, ed. Manson's Tropical Diseases. 20th ed. London, UK: WB Saunders; 1996. 1047-74. Hay RJ, Moore M. Mycology. Champion RH, Wilkinson DS, Ebling FJG, Breathnach SM, eds. Rook/Wilkinson/Ebling Textbook of Dermatology. 6th ed. Oxford, UK: Blackwell Science; 1998. Vol 2: 1277-376. Khatri ML, Al-Halali HM, Fouad Khalid M, et al. Mycetoma in Yemen: clinicoepidemiologic and histopathologic study. Int J Dermatol. 2002 Sep. 41(9):586-93. [Medline]. Lichon V, Khachemoune A. Mycetoma : a review. Am J Clin Dermatol. 2006. 7(5):315-21. [Medline]. Mahgoub ES. Medical management of mycetoma. Bull World Health Organ. 1976. 54(3):303-10. [Medline]. Maiti PK, Ray A, Bandyopadhyay S. Epidemiological aspects of mycetoma from a retrospective study of 264 cases in West Bengal. Trop Med Int Health. 2002 Sep. 7(9):788-92. [Medline]. Mellinghoff IK, Winston DJ, Mukwaya G, et al. Treatment of Scedosporium apiospermum brain abscesses with posaconazole. Clin Infect Dis. 2002 Jun 15. 34(12):1648-50. [Medline]. Mendez-Tovar LJ, Mondragon-Gonzalez R, Manzano-Gayosso P, et al. [Immunoglobulins in patients with Nocardia brasiliensis actinomycetoma]. Rev Argent Microbiol. 2004 Oct-Dec. 36(4):174-8. [Medline]. O'Bryan TA. Pseudallescheriasis in the 21st century. Expert Rev Anti Infect Ther. 2005 Oct. 3(5):765-73. [Medline]. Poncio Mendes R, Negroni R, Bonifaz A, et al. New aspects of some endemic mycoses. Med Mycol. 2000. 38 Suppl 1:237-41. [Medline]. Queiroz-Telles F, McGinnis MR, Salkin I, et al. Subcutaneous mycoses. Infect Dis Clin North Am. 2003 Mar. 17(1):59-85, viii. [Medline]. Ramam M, Garg T, D'Souza P, et al. A two-step schedule for the treatment of actinomycotic mycetomas. Acta Derm Venereol. 2000 Sep-Oct. 80(5):378-80. [Medline]. Saag MS. Mycetoma. Goldman L, Bennett JC, eds. Cecil Textbook of Medicine. 21st ed. Philadelphia, Pa: WB Saunders; 2000. 1885-7. Saarinen KA, Lestringant GG, Czechowski J, et al. Cutaneous nocardiosis of the chest wall and pleura--10-year consequences of a hand actinomycetoma. Dermatology. 2001. 202(2):131-3. [Medline]. Sharma N, Mendiratta V, Sharma RC, et al. Pulse therapy with amikacin and dapsone for the treatment of actinomycotic foot: a case report. J Dermatol. 2003 Oct. 30(10):742-7. [Medline]. MRI coronal section of mycetoma in a 47-year-old shepherd from Mauritania who had a painless progressive swelling of the face for more than 20 years. On this T1-potentiated image, a large heterogenous mass surrounds the cranium. Bone invasion can be observed only in the area of the zygomatic fossa. MRI with coronal view of mycetoma in a 47-year-old shepherd from Mauritania who had a painless progressive swelling of the face for more than 20 years. The mycetoma mass invades the left parapharyngeal space and almost reaches the lumen of the pharynx.